Charity is important to us here at CubanEight. Every year we get together as a team and choose a charity that we would like to raise money for. Once chosen we plan a calendar of fundraising events to raise as much money as we can with the help of donations from friends, family, colleagues and clients. Last year we selected Katharine House Hospice, a local hospice. It costs around £4.5 million to provide their services, and only a quarter of this is received from the government. The remaining £3 million comes from the community, and businesses just like us. These funds mean that patients can stay in the Inpatient Ward and take part in art classes, and that community nurses can visit them at home, as well as providing necessary support to families. 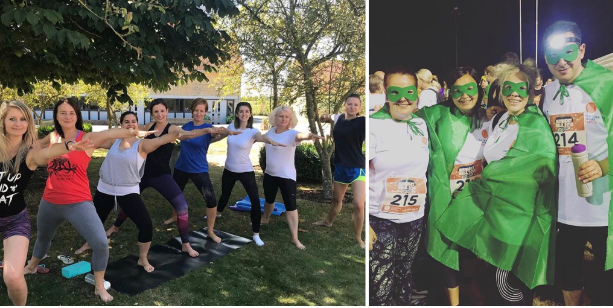 Last year we embarked on a variety of fundraising activities, including two cake sales and enjoying sunshine in our gardens for a yoga session. We also signed up for the Katharine House Hospice Midnight Walk, where four of our team embarked on a 10 mile walk around Banbury finishing at 4am with a bacon butty in hand! We have raised nearly £1000 for this very worthy cause and we would like to thank everyone who donated for their continued support. Now to start planning for this year!